Ready for unbiased information on burning fat? Why do over 2,000,000 readers trust Examine.com? When it comes to opinions on how to approach fat loss, everyone is an expert. Some say stick to low carb diets (which do have evidence behind them). Others say that calories are all that matter, aka calories in calories out (CICO). This is also backed by evidence. It’s also trendy to avoid low-fat diets these days, but still quite a few of them are popular. No matter what your overall dietary strategy, fat loss can be extremely difficult, especially as you get heavier. This is due partially to specific hormonal disruptions, and partially to a wide variety of other factors such as increased depression and altered circadian rhythms. Due to this difficulty, any little bit of help in someone’s personal fat loss journey can be very welcome. Physicians sometimes prescribe one of the small number of prescription fat loss medications for this very reason, including Belviq, Contrave, Saxenda, phentermine, and Qsymi. But these prescription have downsides: they may be costly, have side effects, and just not work that well. Thus, the popularity of fat loss supplements. Although diet as a whole is a much greater factor in fat loss than supplementation, a smart supplementation strategy can give a helpful kick to fat loss efforts. What are your fat loss options? Before looking at the options, you have to understand a little bit about what to expect from a fat-loss supplement, even one that appears to work judging by the available evidence. Firstly, clinical trials only look at a very small subset of the population. For example, did you hear that fish oil helps you lose weight? True… if you’re an elderly woman living in a retirement community. It is incredibly common for supplements to work in a select number of people, but not work in general. Secondly, you have to take the supplements exactly as indicated, which means not skipping any days, making sure your dosages are correct, and that it mixes okay with any other supplements you are taking. It is critical that you take supplements according to specific instructions. For example, the ECGC found green tea is absorbed much better on an empty stomach (which actually contradicts what the label usually says, because the supplement company is more concerned about you avoiding occasional nausea that an empty stomach can sometimes cause). Supplement studies are done on very specific types of people, which often won’t apply to you. And supplements often work best when taken in specific ways, not all of which are well-known. If you can find a food or beverage that you enjoy consuming regularly, which also happens to help with weight management, that can be much more powerful than an individual supplement. The prototypical example is also the most popular I’m-so-tired-I-need-a-_________ beverage in the world: coffee. Coffee and a select few other foods and beverages can directly impact fat loss without doing more activity or eating less food. This can happen increasing metabolic rate, altering the amount of energy we derive from body fat (as opposed to stored carbohydrate), or even creating heat instead of ATP from fuel. As you may already know, you can’t just drink coffee and watch the fat melt away. It takes a specific strategy and dose to get sustained fat loss from coffee or caffeine, or else you can drink many cups a day and see nothing change. Some beverages and foods can impact fat loss through affecting metabolic rate and/or the balance of fuels we use for energy. Coffee is the prototypical example, but normal coffee drinking habits won’t lead to fat loss - a specific strategy is needed. The other food-based option for fat loss takes advantage of what food does once it reaches your gut. You don’t have to know anything about satiety hormones (like peptide YY and ghrelin) to understand how food can make you feel full. So what kind of food makes you feel full? Soda? Rice? Probably not. Digestible carbohydrates are not very filling. One of the major characteristics of a food that influences satiety is fiber content, aka non-digestible carbohydrate. Some of these fibers have also been isolated and sold in supplement form, and some of these have shown very positive results in trials. Fiber is not one monolithic thing though. There are many types of fiber, and only some have been shown to have significant impacts on appetite. And eating too much of certain fibers can lead to long sessions with your local toilet. Food in and of itself is a good option for regulating appetite, and hence directly impacting food intake. The fiber in foods (at least certain types) plays a major role in regulating how full you are. There are so many scammy fat-loss supplements, it’s hard to keep track. From green coffee bean extract to raspberry ketone to garcinia cambogia, the flavor of the month changes depending on what gurus are trying to sell, and their bar for evidence is incredibly low. Our bar for evidence though is incredibly high. We have no ties to any supplement, and change our reviews on a regular basis depending on whatever the most high-quality latest trials say. Most importantly, we try to be as thorough as possible. Heck, there’s even been a case of researchers stealing analysis from us for their published research. If you want to find out specific strategies for fat loss supplementation, our supplement guides are a must have. 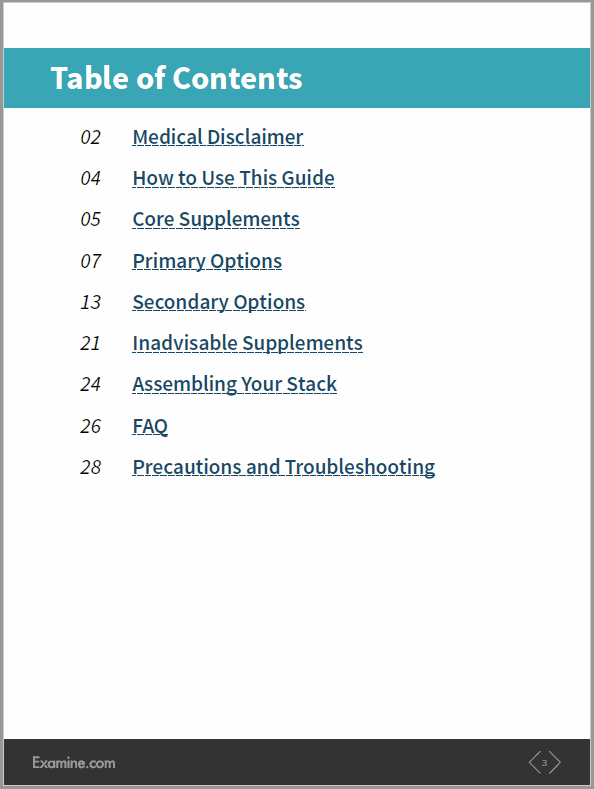 Our readers wanted strategies laid out step-by-step, including supplement doses and forms as well as interactions, and this is the end result of our work. Ready to level up your health? For just the price of three guides!